I bought these cute little salt and pepper shakers today. Does that mean I’m out of my January thrifting doldrums? I love their bright red color and they’ve been on my short list of things to look for when out thrifting, so I was excited to find them at the local old lady run charity thrift store. Don’t they look Valentiney? OK, you got me, I’m a little obsessed with Valentine’s Day decorating ideas right now. Not sure salt & pepper shakers are going to be the center of my decorating theme though. If not for Valentine’s Day, they would look cute in a 4th of July picnic basket. They were in a bag of assorted items that was marked $4.00. I did not want the other items that were in the Ziploc baggie at all, so when I checked out I asked the lady if I could buy the salt and pepper shakers for the advertised $4.00 and then go ahead and donate the other items in the bag back to them. I pay the full $4.00 – I take the salt and peppers – they keep everything else – pretty simple, right? She looked at me like I had asked if I could steal something. I had to explain it three times and then she only grudgingly accepted my donation to their store. With a big sigh, to boot. That’s me. Always rocking the boat. Linking with Time Travel Thursday, Treasure Hunt Thursday, Vintage Thingie Thursday. Very vintage, I remember having some of those in the mid 60’s when I was a new bride. Why is it some clerks can’t get the concept of not wanting everything in the bag…it is almost like they can’t really understand why I would pay the full price and not take everything. when I go to the local auction, sometimes a buy an entire table for $1. I just leave what I don’t want. Probably paperwork for her to do and that is why she wasn’t happy. I think it was nice of you. I think they should be use to that when they bag up random stuff. I love those s & p’s and I would have bought them for $4 also. Next time, just take the bag and then dump what you don’t want back into donation bin! Some people just don’t get it. She is probably still trying to figure out what you said, hah. LOVE the red & white shakers!! Next time take it all and regift it to them at a later date. You always have the best luck. Can’t believe she was irritated you were giving part of the stuff back. My dad used to go to farm auctions and would buy a whole wagon of stuff super cheap just because he saw an interesting old tool on there. Of course he’d end up carting home quite a bit of the other stuff and making my mom crazy! If it’s red, I’m in. I love red. 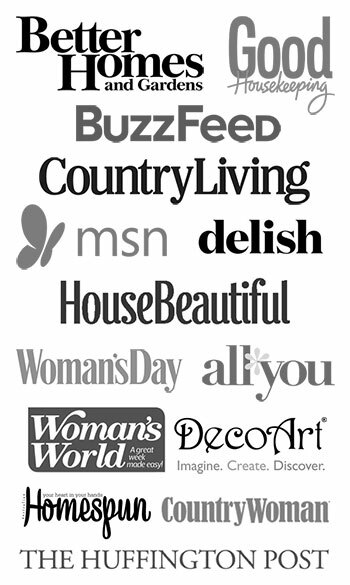 Great find, Pam…love the graphic look! Perfect for a Valentine lunch with a frilly table runner of some sort! loved it!! and $4.00 wow! sometimes people just don’t get it! i love the idea of using them for the 4th – they’re begging to be set upon a picnic table w/ red checked tablecloth & all the fixins! Definitely a great find. I have a couple of picnic baskets they would be swell with! Super photo. THOSE ARE TOO CUTE!!!!!!!!!! We have some crotchety ladies at one of my favorites thrifts too. Must be a rule??? Those are just sweet! I definitely would have bought them too! SO retro cute, Pam! Great vintage kitchen score! Red is always in style! I’ve gone though the same thing at these stores. You can’t throw old ladies curves (I hope people remember that when I’m old!). Better to just buy it all then donate the unwanted items at a later date. Makes everyone happy. Someone in my family had a set of these with the canister set. I still see them once in awhile in the antique malls. Oh how adorable Pam. I would have snatched them up too! I just found the matching canister set to these for $5.00 myself–I love red and white together. I never understand thrift store employees…they seem to be unable to comprehend simple solutions. Those are wonderful! Great find and perfect for the season. 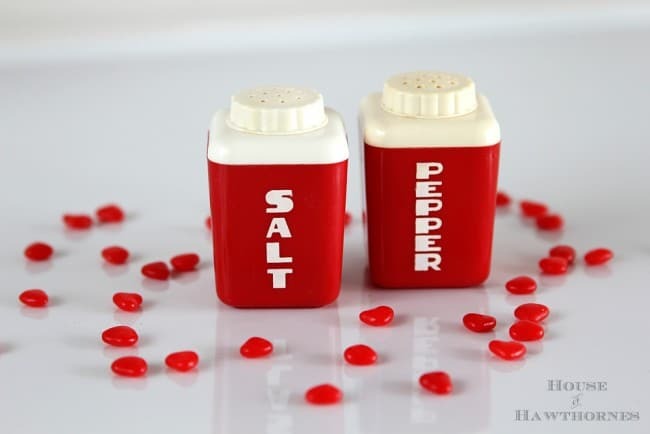 Cute little salt and peppers, I love your ideas for using them, too. Next time, just take it and put the rest in the drop off box! Love the shakers! Can’t wait to see how you decorate for Valentines Day~ one of favourite holidays. Those are so darling, love them! Enjoy! I found one of my usual thrift stores really picked over. But I did manage to find a basket for an arrangement for the front door (it had bug dirt in it , so it is still outside waiting to be washed with bleach water) and the other item that I am really happy about and unable to put down is a copy of the book “Under the Tuscan Sun”. I loved the movie a few years ago, so I thought I’d love the book too. Well, I do love the book,it has several recipes and is well written. I haven’t figured out how the movie of the same title ever came from that book. I guess the movie was “an interpretation”. Anyway, the blah-ness of the store led me to wonder if it is just me or was the store really that blah. Am I “over it” with thrifting? Nah, no way. So darn cute! Great price, and I want to do the same thing often, but find it’s easier to take the whole bag home and put the extras in my donate box. he he Love the bright colour! 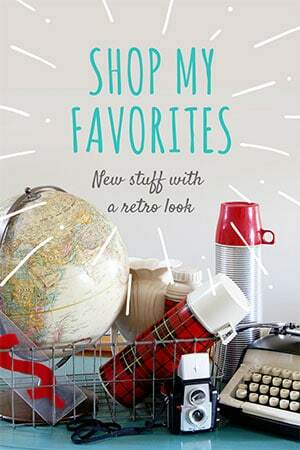 I finally hit the thrifting jackpot…take a look at my latest blog post! Awesome find, Pam! I might have just found the matching canister set. Does your S&P set say Burroughs Mfg on the bottom? I love these! I’ve got them in green. Maybe the cashier must not have understood? Whenever I tell them I don’t want the rest of the stuff from the grab bag, they look at me stunned, unless they are younger. Like “HOW!! could you not want this? You’re paying for it.” & sometimes I get that clueless look the, “I don’t understand”. Good price, I paid $12 at an antique market.